Before installing the transmission control cable assembly, check that the park/neutral position switch and the shift lever are in neutral. 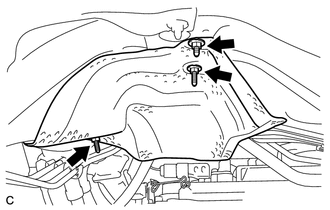 (a) Pass the control cable from the cabin to the engine compartment. (b) Install the No. 2 shift cable grommet retainer with the 2 bolts. 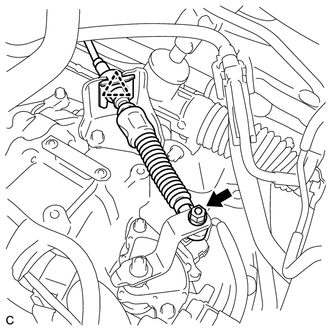 (c) Connect the transmission control cable to the No. 2 transmission control cable bracket. (d) Before attaching cable to transmission, make sure to pull cable through dash grommet into engine compartment side until cable crimp is fully seated against dash grommet. 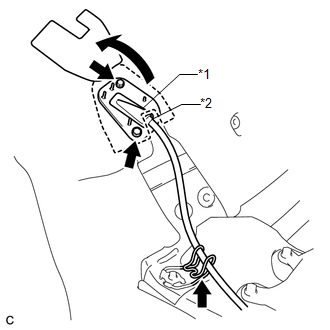 (e) Connect the transmission control cable to the transmission control shaft lever with the nut. (a) Install the front No. 1 floor heat insulator to the body with the 3 nuts.